Goats (Capra hircus) were among the first domesticated animals, adapted from the wild bezoar ibex Capra aegargus in western Asia. Bezoar ibexes are native to the southern slopes of the Zagros and Taurus mountains, and evidence shows that the goat descendants spread globally, playing an important role in the advancement of Neolithic agricultural technology where they were taken. Beginning between 10,000-11,000 years ago, Neolithic farmers in the Near East starting keeping small herds of ibexes for their milk and meat, and for their dung for fuel, as well as for materials for clothing and building: hair, bone, skin, and sinew. 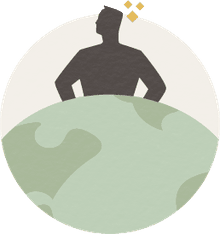 Today over 300 breeds of goats exist on our planet, living on every continent except Antarctica and in a quite astonishing range of environments, from human tropical rain forests to dry hot desert regions and cold, hypoxic high altitude regions. Because of this variety, the domestication history was a bit obscure until the development of DNA research. Domestication in goats has been recognized archaeologically by the presence and abundance of the animal into regions that were well beyond western Asia, by perceived changes in their body size and shape (called morphology), by differences in demographic profiles in wild and domestic groups, and by stable isotope recognition of their dependence on year-round fodders. Archaeological data suggested two distinct places of domestication: the Euphrates river valley at Nevali Çori, Turkey (11,000 years ago [bp], and the Zagros Mountains of Iran at Ganj Dareh (10,000 bp). Other possible sites of domestication posed by archaeologists included the Indus Basin in Pakistan at (Mehrgarh, 9,000 bp), central Anatolia the southern Levant, and China. Studies on mitochondrial DNA (mtDNA) sequences (Luikart et al) indicate there are four highly divergent goat lineages today. Luikart and colleagues suggested that means either there were four domestication events, or there is a broad level of diversity that was always there in the bezoar ibex. 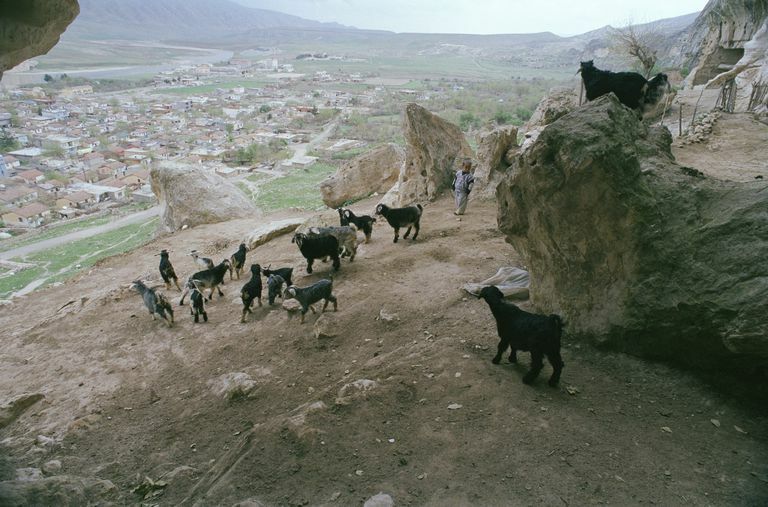 A study by Gerbault and colleagues supported Luikart's findings, suggesting the extraordinary variety of genes in modern goats arose from one or more domestication events from the Zagros and Taurus mountains and the southern Levant, followed by interbreeding and continued development in other places. A study on the frequency of genetic haplotypes (basically gene variation packages) in goats by Nomura and colleagues suggests that it is possible there may have been a southeast Asian domestication event as well, but it's also possible that during the transport to southeast Asia via the steppe region of central Asia, goat groups developed extreme bottlenecks, resulting in fewer variations. Makarewicz and Tuross looked at stable isotopes in goat and gazelle bones from two sites on either side of the Dead Sea in Israel: Middle Pre-Pottery Neolithic B (PPNB) site of Abu Ghosh and the Late PPNB site of Basta. They showed that gazelles (used as a control group) eaten by the occupants of the two sites maintained a consistently wild diet, but goats from the later Basta site had a significantly different diet than goats from the earlier site. The main difference in the oxygen and nitrogen stable isotopes of the goats suggests that Basta goats had access to plants that were from a wetter environment than that near where they were eaten. That was likely the result of either the goats being herded to a wetter environment during some part of the year or that they were provisioned by fodder from those locations. That indicates that people were managing goats in so far as moving them from pasture to pasture and/or providing fodder by as early as 8000 cal BC; and that was likely part of a process that began earlier still, perhaps during the early PPNB (8500-8100 cal BC), coinciding with reliance on plant cultivars. Important archaeological sites with evidence for the initial process of goat domestication include Cayönü, Turkey (8500-8000 BC), Tell Abu Hureyra, Syria (8000-7400 BC), Jericho, Israel (7500 BC), and Ain Ghazal, Jordan (7600-7500 BC). Fernández H, Hughes S, Vigne J-D, Helmer D, Hodgins G, Miquel C, Hänni C, Luikart G, and Taberlet P. 2006. Divergent mtDNA lineages of goats in an Early Neolithic site, far from the initial domestication areas. Proceedings of the National Academy of Sciences 103(42):15375-15379. Gerbault P, Powell A, and Thomas MG. 2012. Evaluating demographic models for goat domestication using mtDNA sequences. Anthropozoologica 47(2):64-76. Luikart G, Gielly L, Excoffier L, Vigne J-D, Bouvet J, and Taberlet P. 2001. Multiple maternal origins and weak phylogeographic structure in domestic goats. Proceedings of the National Academy of Sciences 98:5927-5932. Makarewicz C, and Tuross N. 2012. Finding Fodder and Tracking Transhumance: Isotopic Detection of Goat Domestication Processes in the Near East. Current Anthropology 53(4):495-505. Naderi S, Rezaei H-R, Pompanon F, Blum MGB, Negrini R, Naghash H-R, Balkiz Ö, Mashkour M, Gaggiotti OE, Ajmone-Marsan P et al. 2008. The goat domestication process inferred from large-scale mitochondrial DNA analysis of wild and domestic individuals. Proceedings of the National Academy of Sciences 105(46):17659-17664. Naderi S, Rezaei H-R, Taberlet P, Zundel S, Rafat S-A, Naghash H-R, El-Barody MAA, Ertugrul O, Pompanon F, and for the Econogene C. 2007. Large-Scale Mitochondrial DNA Analysis of the Domestic Goat Reveals Six Haplogroups with High Diversity. PLoS ONE 2(10):e1012. Nomura K, Yonezawa T, Mano S, Kawakami S, Shedlock AM, Hasegawa M, and Amano T. 2013. Domestication Process of the Goat Revealed by an Analysis of the Nearly Complete Mitochondrial Protein-Encoding Genes. PLoS ONE 8(8):e67775. Vahidi SMF, Tarang AR, Naqvi A-u-N, Falahati Anbaran M, Boettcher P, Joost S, Colli L, Garcia JF, and Ajmone-Marsan P. 2014. Investigation of the genetic diversity of domestic Capra hircus breeds reared within an early goat domestication area in Iran. Genetics Selection Evolution 46(1):27. Zeder MA. 2001. A Metrical Analysis of a Collection of Modern Goats (Capra hircus aegargus and C. h. hircus) from Iran and Iraq: Implications for the Study of Caprine Domestication. Journal of Archaeological Science 28(1):61-79. Zeder MA, and Hesse B. 2000. The Initial Domestication of Goats (Capra hircus) in the Zagros Mountains 10,000 Years Ago.Science 287:2254-2257. How Can Archaeologists Tell if an Animal is Domesticated? Who First Turned the Wild Grape Into Raisins and Wine? How Many Times Do Sheep Need to Be Domesticated? When and Where were Donkeys First Domesticated?